Yesterday (Saturday 8th September) saw the second Brighton Mini Maker Faire. It was utterly awesome. Or so I’m told. In fact, we didn’t get to see much of the rest of the ‘faire since we were inundated with questions and queries about our CNC drilling machine – not least of all how we’d managed to make it so cheaply (cost to date is about £30 for all parts, motors and electronics – less than the cost of a single stepper motor driver board, or a single – really good quality – stepper motor). The day started with us trying to resolve some of the issues we’d encountered the previous Thursday – namely reducing the servo z-axis speed, measuring the backlash accurately and improving the software. Of course, no sooner had we written two lines of code than the doors opened and we were swamped all day! 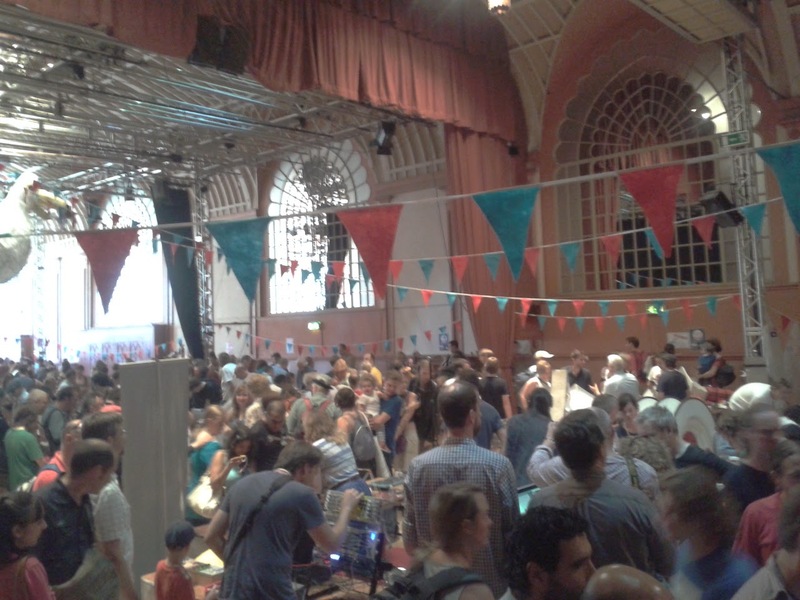 This year, the Maker Faire took over the whole of the Brighton Dome Foyer AND the Corn Exchange next door. It was a massive venue, and was rammed busy from the moment the doors opened at 10am until the final whistle blew some time after 5pm! So we managed to un-hack a few changes made to the CNC machine to get it working again and demonstrate the drilling action – complete with software control of the drilling head (when we tried the machine last Thursday, we had to control the drilling spindle separately and leave the head spinning all the time). We didn’t have time to implement (and test) all the changes we’d proposed, but had a great day, meeting people, sharing ideas and generally talking nerd. Maybe next year we’ll need to attend not as “makers” (as in these last two MakerFaires) but as visitors, to see what everyone else is up to!